I recently came across a company called DaffaDoot. 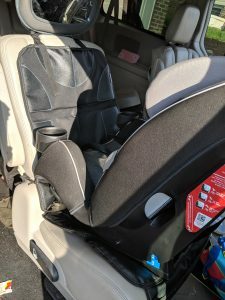 I was given a complimentary Car Seat Protector. 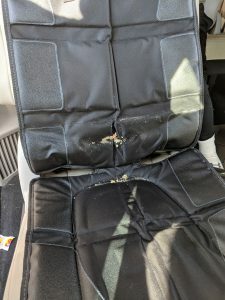 I was really excited to see how well it holds up because we are always traveling for softball or baseball (out of state) and my youngest’s seat gets a beating. I was able to install it before we went on a road trip from Pennsylvania to Wisconsin. Look how nice it looks all snuggly under the car seat. Check out how it looked AFTER the trip and after another 3 weeks of getting my youngest in and out of the car with muddy shoes, grassy shoes, wet shoes, and with an everlasting supply of snacks. Can you believe that’s IT? Yeah that was caked and crusty but look at where his feet were. It’s like magic! It was CLEAN! Now, check out what it looked like after I took less than a minute to clean it. Cool, huh? 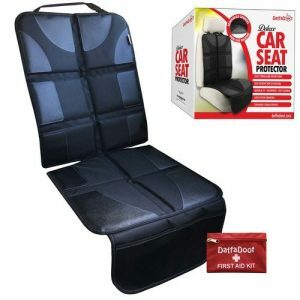 I would definitely recommend DaffaDoot’s Auto Seat Protector! 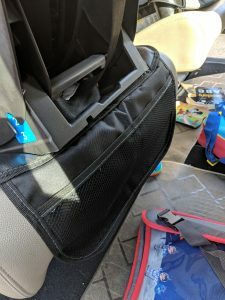 It’s material really withstands the wear and tear of getting a toddler in and out of a carseat. Check out DaffaDoot’s information below. Oh and did I mention how I love their mission? They donate their time and money to numerous organizations that they care deeply about. DaffaDoot is all about family values and we are on a mission to improve the lives of everyone we can reach. We are a Mother/Daughter team, and proudly donate our time and money to numerous organizations supporting pregnant moms-to-be, new parents, battered women, and school age children. We are insanely committed to providing the best customer service on the planet and delivering only the highest quality products available. Happy Times! DaffaDoot Brings It! DaffaDoot Baby Reflux Wedge Pillow. For babies who frequently suffer from reflux or dramatically spit-up. It’s a safe, natural baby reflux treatment which gently elevates the baby’s head and torso to help alleviate discomfort due to frequent stomach acid or frequent spitting up. We used only the best material, making it waterproof, hypo-allergenic, and anti-bacterial. 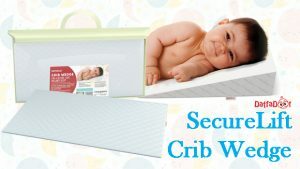 Drooling, spit-up, and leaky diapers can all wreak havoc, but cleanup with a disinfectant wipe or warm rag is a breeze. It sports a non-skid bottom (holding the wedge firmly in place for safety and convenience), is free of harsh chemicals, and meets and exceeds all federal safety regulations. Happy baby equals happy parents! 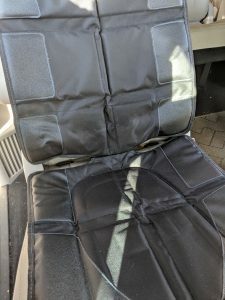 Deluxe Auto Seat Protector-This is what I tried and it’s AWESOME! Our latest release, the Deluxe Auto Seat Protector is exactly what you need. Other mats or pads can’t compete with our 14mm padding and heavy duty durability. Our neoprene non-slip backing grips like no other, and our Universal Fit with an extended “lock-down” bulb ensures that no matter what you drive, it’s perfect for you and your kids. It’s Full-Size, Premium Construction, with No Compromises. We’ve used only the strongest material and threads, and reinforced in ALL the right places. Many protectors provide only a sliver of extra fabric and claim to protect your seat, but we refuse to compromise on quality. It’s evident from the first moment you take our protector out of its box. You will enjoy the premium feel, the superior stitching, and the quality fabric. Did we mention that it’s anti-slip and color-fast? We even baked it in an oven to make sure it could take the heat. And it has spacious elastic storage pockets where you can keep things like diapers, pacifiers, bottles, sippy cups, toys, wipes…and yes, a bag of extra Cheerios. Bottom line, it’s perfect for you and perfect for your little one. Your baby’s smile is worth it! No doubt about it! That’s why we insist on the highest quality, with just the right amount of curvature, shatterproof glass, and a solid stay-put mount… all so Baby gets a perfect reflection of herself in the mirror. She will have a blast babbling, giggling and jabbering at that “other baby in the mirror.” And should she get lonely, she simply needs to look up and can see Mommy looking back at her! Oh yeah, because you can see her too! Just like you, DaffaDoot is all about safety, and we understand how frightening it can be when you’re driving and baby makes a funny choking sound, and you can’t see around her rear facing car seat to see why! 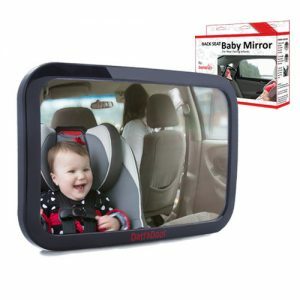 Boost your confidence with the safer baby car mirror specifically designed and tested for parents wanting a safe way to view Baby. It’s the Best of the Best with its independent lab-crash-test, safety tested rating, and shatterproof crystal-clear reflection. Installation is an absolute breeze! No tricky parts to snap together, no tools needed, & installs in seconds. (Requires an adjustable headrests for proper installation.) You can rest easy because here at DaffaDoot, we are totally committed to providing a robust, quality product, & if you have ANY problems with your DaffaDoot mirror, simply let us know and we promise to make it right. We truly want you to love our mirror as much as we do. It’s that simple.